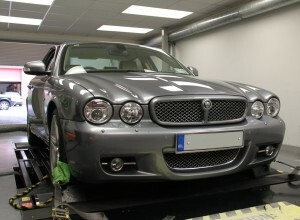 Jaguar Tuning at Viezu – Jaguar XJ Diesel Super Car Performance at 50mpg! Jaguar Tuning is one of our favourite pass times here at Viezu, this year we have already developed extensive tuning programmes for the full range of Jaguar vehicles, including XF, XK and XKR tuning and ecu remapping, this week we have taken the opportunity to revisit our Jaguar XJ tuning. We already have a significant range of tuning for the XJ, but felt it important to extend this to include our Blue Optimize ecu remapping and tuning. Viezu’s Blue Optimize tuning is guaranteed to deliver power, fuel saving and improved vehicle emissions. After extensive development this week, we now have a significant range of Jaguar XJ tuning options, including fuel saving and MPG boosting tuning, whilst still adding additional power, torque and throttle response. Jaguar tuning is very popular, and the Jaguar XJ reacts very well to the subtle changes to fuelling and turbo settings by the Viezu technicians and master programmers an additional increase in power of 40-50bhp is completely realistic. The same can be said of the XJ’s stable mates the Jaguar XF and XK, and XKR, most versions of the Jaguar engines can be tuned, for power, performance and improved economy. Viezu Jaguar tuning is simply and easily carried out through the OBD port, (diagnostic port) no ecu removal is needed, Viezu has dealers all over the world – please e-mail us for your local dealer and further details on our range of Jaguar tuning and performance products, as well as an extensive range of ECU remapping and performance car tuning services.